According to the U.S. Consumer Product Safety Commission, every year neglect of clothes dryer exhaust vent cleaning results in over $107.3 million dollars in residential fire property loss, in fact there are more house fires caused by dryer vents in the U.S. every year than by chimney fires! Lint and additional debris can build up in your clothes dryer vent and may cause your dryer to exhaust at less than optimum efficiency. This creates potentially hazardous conditions including carbon monoxide intrusion (in gas dryers) and exhaust fires (in all types of dryers). If a clothes dryer is improperly vented or the exhaust duct is blocked by lint or debris, carbon monoxide can be forced back into your living space or a fire can easily start from the heat and debris build up. 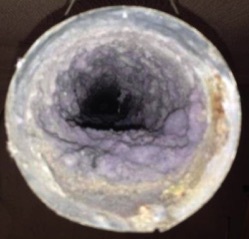 When our technician inspects and cleans your dryer vent, they also verify that the proper type of duct is in use. For example plastic transition ducts (joining the dyer to the wall) should be replaced with metal duct because it is non-flammable unlike plastic. Annual dryer exhaust vent cleaning and inspections are more necessary than ever before due to the complex construction of homes today. Newer homes tend to have dryers located away from an outside wall in kitchens, bathrooms and hall closets which is convenient, but potentially dangerous from a safety standpoint. These new locations mean dryers tend to be vented longer distances and vents are generally installed with more bends to accommodate the extended path they must take through the home. 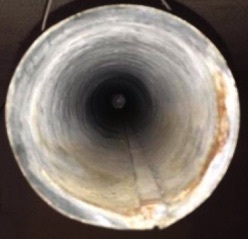 As a result, dryer ducts are harder to access and this additional length creates more places where lint can collect and animals and birds can hide. A clean exhaust duct prevents heat and moisture (and in the case of gas dryers – carbon monoxide) from being trapped in your home. When this type of spillage occurs, energy, natural resources, and time are all wasted because your appliance works too hard and runs longer than necessary. If your dryer takes twice as long as it should, the number of loads that it will dry in its life time is cut in half. A clogged vent will cause the dryer to run at a higher temperature because the heat can’t get out which will decrease the life of your clothes dryer even more. Then this will lead to the heating element burning out prematurely or a fire could ignite as a result of over worked safety controls. Clothes that have to spend twice as long tumbling and rubbing against one another will produce more lint and simply wear out faster. According to the manufacturer’s specifications and building codes, dryer ducts must be at least 4” diameter and at least as large as the dryer exhaust outlet. Unless otherwise specified by your dryer’s manufacturer, the length of your dryer’s exhaust should not exceed 25 feet. When determining length each 90 degree turn adds 5 feet to the actual length. Dryer vents shall be independent of all other systems and terminate outdoors not into an attic and especially not in to a chimney (which is severely dangerous situation due to poisonous gas intrusion and fire hazards). Your outside dryer exhaust vent’s termination hood should be equipped with a back-draft damper to ensure that the exhaust doesn’t come back into the house. Plastic and aluminum flexible duct can not be cleaned it will tear open when the brushes and rods go through it. All flex duct should be replaced yearly. 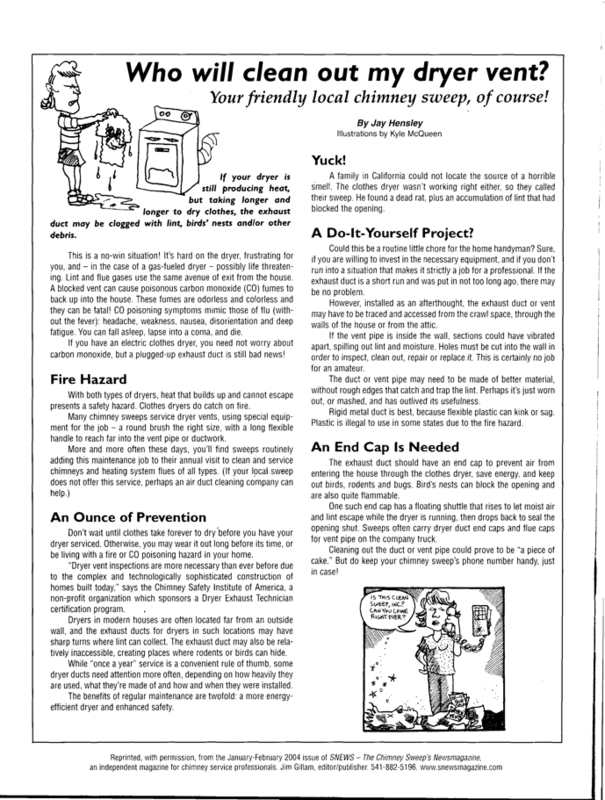 (Plastic and vinyl flex duct is illegal for use in dryer vents and was outlawed decades ago, it is very flammable and incredibly dangerous to have in your home, in fact if you have it in your home, it should have been replaced decades ago! You can tell if it’s plastic or vinyl by the color, it’s always white.) Rigid metal ducting is all that is allowed to be inside of walls. Metal transition ducts should be used between the dryer and the exhaust termination (again, never any of that white flex plastic hose - it’s flammable! and was outlawed decades ago). You can use metal flex ducting from the dryer to the wall (but you can not have any type of flex duct in the walls! Not even metal flex duct!). Rigid metal (even as a transition duct from the dryer to the wall) is always much better as lint will stick into the corrugations of a flexible transition duct. Rigid metal is smooth on the inside and will allow the exhaust vent to have a higher velocity. Remember building codes prohibit the use of any type of flexible duct in walls, you must use rigid metal exhaust pipe in and behind walls. The use of flex ducting in the walls would not allow you to clean your dryer vent duct, it would have to be replaced, and that can be difficult and costly if it is sealed into a wall. Walls would have to be opened up for replacement access. Chimney Savers recommends cleaning and inspecting your dryer vent on an annual basis to ensure efficient operation of your clothes dryer system.